Why are we "Round Barn" Fiber Mill? 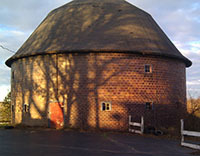 Our property is home to the Robert Weber Round Barn. It was built in 1917, and is a banked barn, meaning that it was built into the bank of a hill. The barn has 3 stories (if you count the hay mow). It is 55 ft in diameter and has a 60-ft tall, 24 -ft in diameter silo hidden inside. It was a fancy barn for its day, being built out of tile instead of wood or brick. Originally it was built as a high efficiency (for 1917 mind you) dairy barn with its design being based on the round barns built at the University of Illinois, which also still stand today. It is listed on the U.S. National Register of Historic Places, and there is even a Wikipedia article about it! Currently the barn is home to our flock of JSBA registered American Jacob sheep , our two llamas, a barn cat, and our Great Pyrenees Livestock Guardian Dog, Heidi. You can learn more about our amazing breed of sheep at our flock website, and at the Jacob Sheep Breeder's Association website . Round Barn Farm and Fiber Mill is owned by Jim and Margie Schafer. We are a small, family-run wool and fiber mill in northern Illinois, just four miles south of the Wisconsin border. Our adventures with fiber began many years ago. Margie grew up with fiber arts, learning to crochet and knit as a child. After the Schafers married, Jim surprised Margie one Christmas with a beautiful spinning wheel and a set of spinning lessons to go along with it. Margie learned to spin using (Jacob!) roving, but soon that was not enough, and she bought her first raw fleece. It happened to be a beautiful Jacob fleece. That was followed by a number of additional fleeces. At the time, we lived in the city, and we're not sure what the neighbors thought Margie was doing on Sunday afternoons with those fleeces and buckets spread out on the front driveway! As it happened, her interest in wool and sheep became an obsession, and within a few years we decided to move to the country to raise our own. As we built a small flock of registered American Jacob Sheep, and learned to keep and care for our fiber animals, we gained experience processing their fiber into roving and yarn at home, and began to think about expanding these interests. We decided to start our mill operation after we sold our rural Internet company. We wanted to work in a business that was closer to home, family oriented, and more sane than Information Technology. Since we raise sheep, we're not afraid to get our hands dirty; on the contrary, we kind of like it. Both of us have experience with raising fiber animals and processing their fiber, and Jim has been an entrepreneur and small business owner for many years. So a fiber processing business seemed like a good fit for us. It's real, honest work. and we are excited about supporting other fiber farmers by helping them transform their raw fleece into a high value, finished products. We are proud to be full-service wool and fiber mill, with custom-made, state-of-the-art equipment, and we are eager to assist you by processing your fiber into beautiful, marketable products.